Yelena Yevteyeva was born in Leningrad on 14 March 1947 graduating from the Vaganova School in 1966 under the renowned professor Lydia Tiuntina. She immediately joined the Kirov Ballet and was soon dancing leading roles. Yevteyeva is a somewhat paradoxical dancer. She is not a conventional classical ballerina and with the exception of Swan Lake and La Bayadere has not concentrated on the traditional classical roles one associates with the Kirov. She did however perform Odette/Odile in Sergeyev's 1968 film of Swan Lake replacing an originally scheduled Natalia Makarova. This role was one of her early great successes on the stage alongside Nikiya in La Bayadere and Medora in Le Corsaire. Yevteyeva was not a dancer concerned with technical feats. She had a strong and well-grounded technique which served her well, but her major contribution on stage was the depth of her interpretations borne out of her great plastique gifts. This particularly characterised her Giselle, which she studied in great depth for almost two years with Natalia Dudinskaya. The first act was charged with intense emotions culminating in one of finest mad scenes in the ballet's history on the Kirov stage. By contrast the second act was the pure embodiment of the spirit of the romantic, almost substanceless with her light clear high jump and beautful control in adage. She genuinely seemed to be an ethereal other-worldly presence on the stage. In the 1988 Kirov Ballet tour to London she had an immense success as Giselle. Among her classical roles one must also mention her truly stunning Princess Florine in The Sleeping Beauty. Fortunately this was filmed in 1983 and her beautifully sculptured outlines are clear to see. Her main repertoire was more on the dramatic side including Maria in The Fountain of Bakhchisarai, and two very impressive Grigorovich heroines Shirin (The Legend of Love) and Katerina (The Stone Flower). 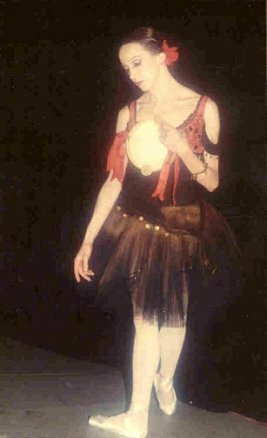 Her Juliet in the 1991 restaging of Lavrovsky's ballet remains possibly the highest point of her dramatic abilities on stage. She was both heroic and vulnerable, and had a powerful grip on the emotions of the audience. Yevteyeva has also been at the forefront of contemporary Russian choreography and danced many roles requiring dramatic skill and great understanding of plastique. She is a dancer of immense intensity on stage. One would have to mention the leading roles in Igor Belsky's Leningrad Symphony and Roland Petit's Notre Dame de Paris as among her most inspired interpretations. 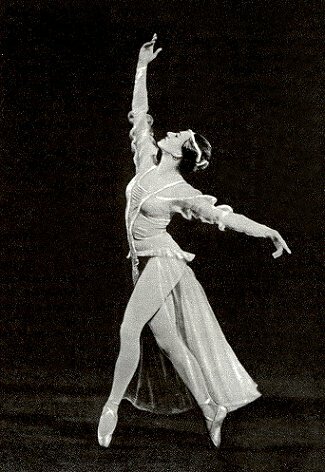 In romantic ballets Yevteyeva has also had some of her biggest successes. In addition to Giselle she has also danced Teresina in Napoli and the title role in La Sylphide with great success. The neo-romantic style of Chopiniana was also tailormade for her. She began her work as repetiteur with the Kirov whilst still active as a dancer in 1989. She retired from the stage in 1993. Since then she has continued her work as a repetiteur with the Kirov Ballet and is a professor at the Vaganova Academy. Her pupils from the School have included Svetlana Zakharova and Daria Pavlenko, while at the company itself she has been coaching Pavlenko, Natalia Sologub, Yulia Makhalina, and Veronika Part, among others. Text of Yelena Yevteyeva Copyright © 2003 Geoff Whitlock. All rights reserved. Copyright © 2000-2009. All rights reserved.